When I started gardening I always made lists of what I wanted to accomplish that day, or that week. However those lists quickly became a source of frustration. Once outside, I always got sidetracked by the many additional things that need to be done. As a result, today, on a gorgeous early fall day, I am happily working in the garden without a list. I only came into the house to write down the last two quince recipes, and, of course, to have a slice of the Quince Meringue Pie I made this morning. 1. Bring water and sugar to a boil. Cut the quinces into chunks and cook covered for about 40 minutes, or until soft. Remove from the heat and cool. 2. Puree the quinces very finely with all of the cooking liquid. As long as you peeled and cored the quinces neatly, there is no need to strain the mix. Refrigerate overnight. 3. Add the applejack to the chilled mixture and stir well. Process in an ice-cream maker according to manufacturer’s instructions. Since this recipe makes a large amount, I processed it in two batches and put the freezer bowl back in the freezer after the first batch until it was solidly frozen again. 4. 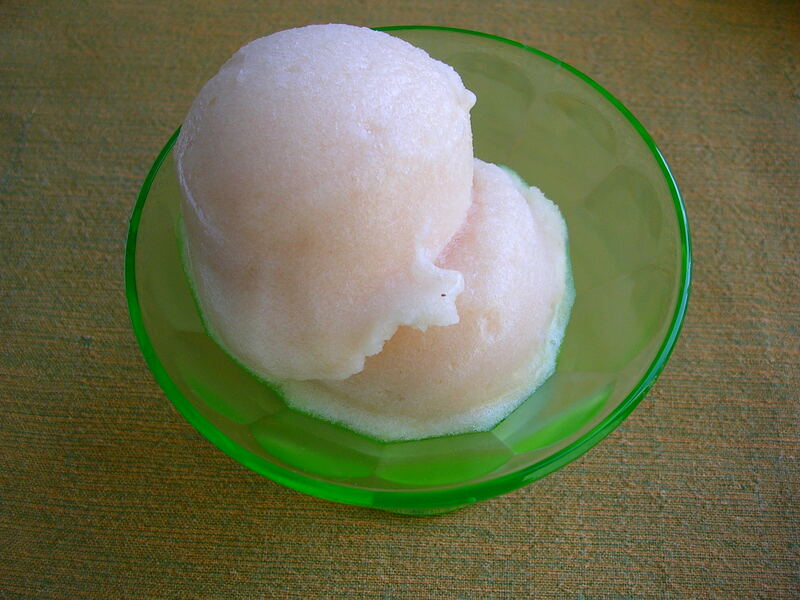 Fill sorbet in airtight freezer containers and freeze for 12 hours, or until solidly frozen. Take sorbet out of the freezer 15 to 20 minutes before serving to soften, but not much longer because it melts quickly. 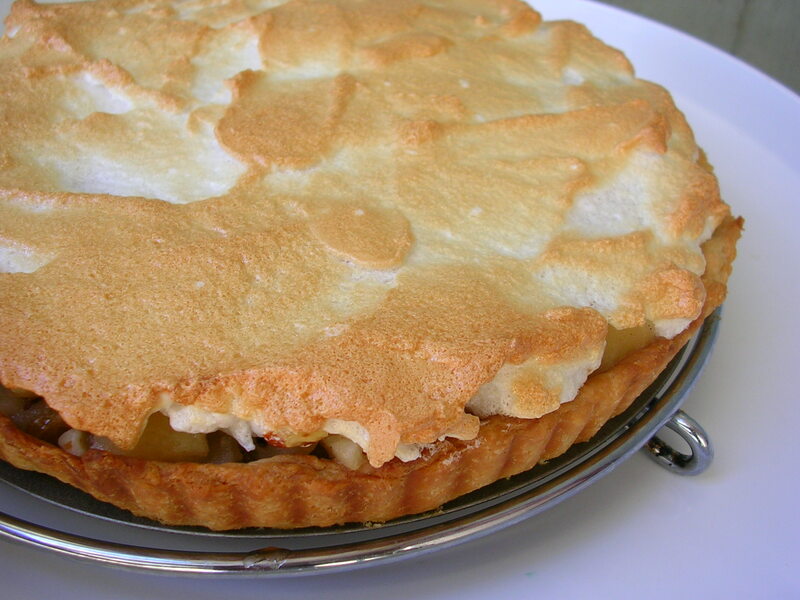 This pie tastes best the same day, as the meringue tends to get soggy after a while. 2. For the pie crust, mix flour, salt and shortening with a pastry blender until crumbly. Add poaching liquid by tablespoons until the dough holds together in a ball. Blend briefly to get rid of any lumps. 3. Roll out the dough to an 11-inch circle between two sheets of wax paper. Remove the top layer of the wax paper and flip the wax paper over to fit the circle into a 9-inch fluted pie pan with removable rim. Carefully remove the wax paper. Let the dough come up to the height of the rim. Trim the dough along the rim with a sharp knife. 4. Loosely line the crust with lightly greased aluminum foil (shiny side down) and fill with pie weights. Bake in the preheated oven for 10 minutes. 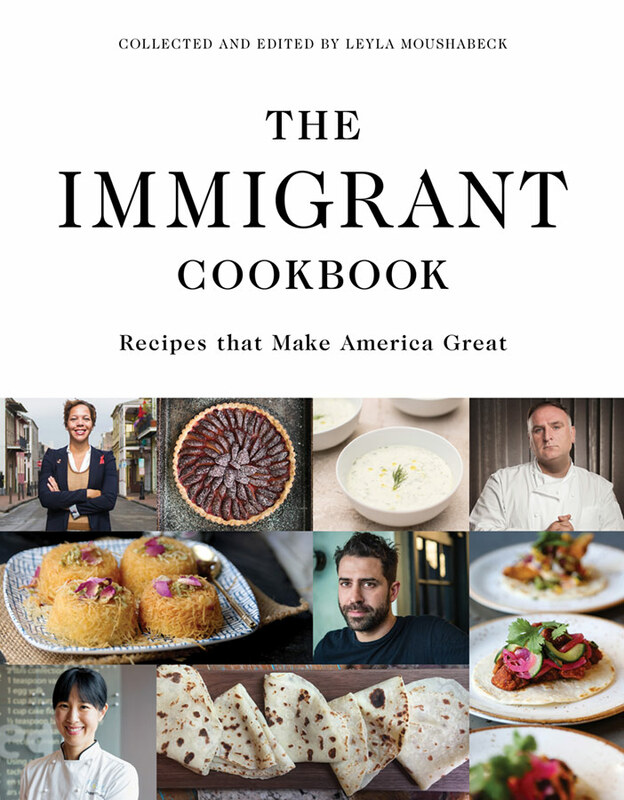 Reduce the temperature to 350 degrees Fahrenheit, remove the pie weights and the aluminum foil and bake for 10 to 13 more minutes, or until the crust has a golden brown color. Let cool on a wire rack. Do not turn the oven off. 5. 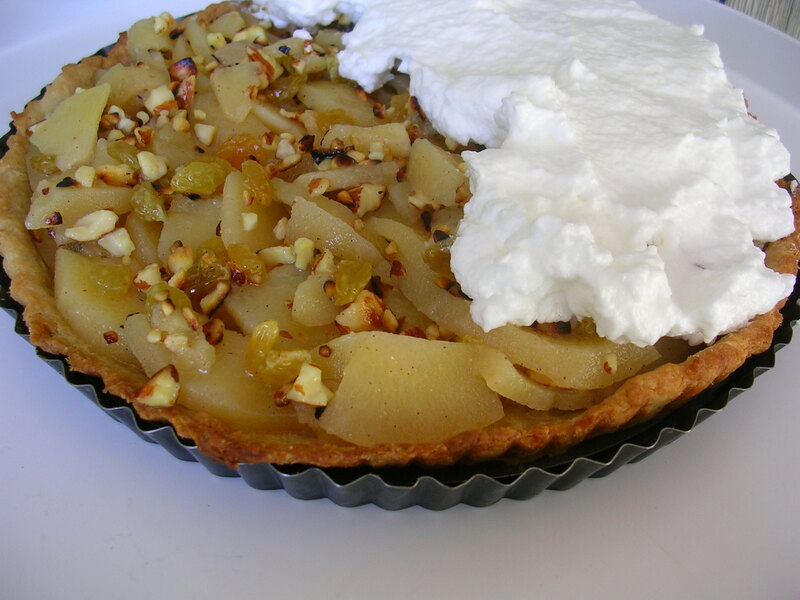 While the pie crust is baking, toast the almonds in an ungreased pan until lightly browned and fragrant. Set aside to cool. 6. Wash the raisins under warm water and pat dry with a paper towel. Mix with the rum in a small bowl. 7. Whip the egg whites until very stiff, gradually adding the confectioners’ sugar. 8. Carefully toss the poached quince slices with the almonds and raisins with rum. Arrange them on the cooled crust. Top with the meringue and bake in a 350 degrees F preheated oven for 12 to 15 minutes, until the peaks are lightly browned. Remove the pie rim and let cool on a wire rack.